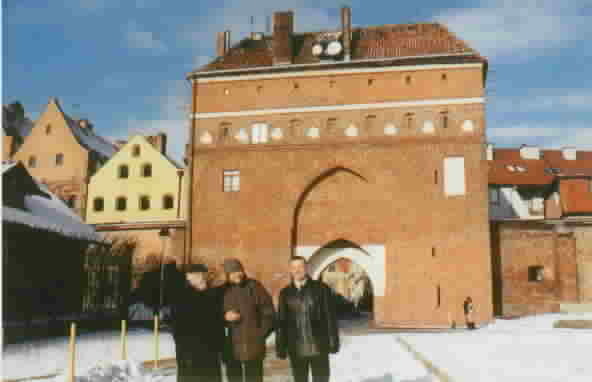 My next exploration was at the Torun Teacher Training College in Torun, Poland. 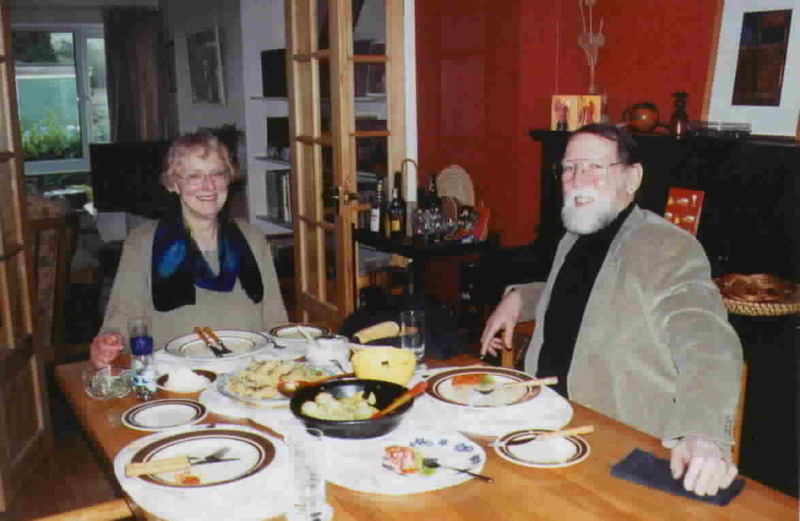 But, before I went to Poland, I stopped to visit Anita Debska at her home in Wivenhoe, England. Anita, with Joanna Ciechanowska, has been instrumental in setting up the drama course for first year teacher/trainers at the college and she wanted to explain the purpose of the program to me before I actually appeared at the college. 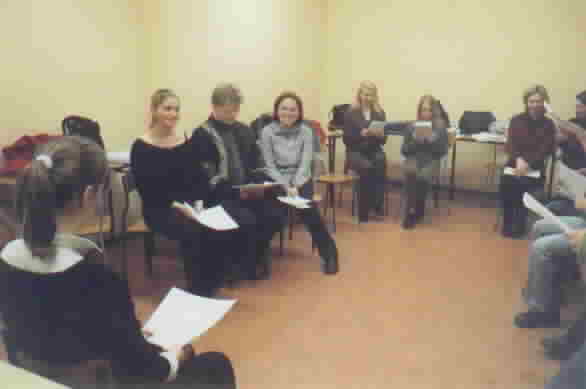 "In our course we adopt and adapt theatrical techniques and skill exercises that are often used by actors and students of drama proper but which we think also appropriate for those who are to teach a language and manage groups of people in a classroom. 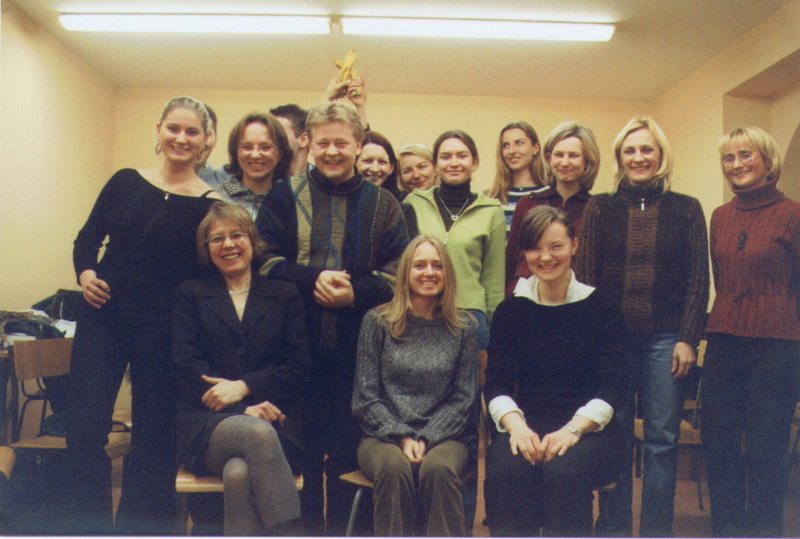 The course includes a wide range of activities designed to give students an introduction to the vast resources of drama, to provide them with both varied opportunities for enhancing their own use of English and some teaching techniques they may later use themselves, to develop confidence and flexibility, to offer them the opportunity to experiment in a supportive atmosphere and enrich their experience of the possibilities of language and of literary texts. We see drama as a valid discipline in its own right and also eminently suitable for cross-curriculum education, supporting and enhancing the teaching of such subjects as speaking, writing, literature, history and cultural studies." 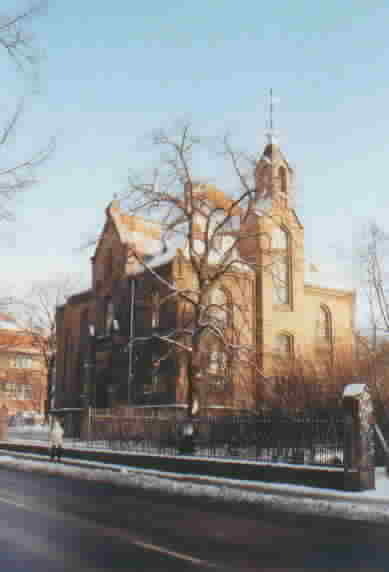 The course has a thirty hour, ninety minutes-per-session structure and is mandatory for all first-year students in their first semester at Torun NKJO. The content of the course is outlined in the following syllabus. We have laid our dreams under your feet. Tread softly, because you tread on our dreams. Armed with such an overview, I set off for Poland and the Torun Teacher Training Collge. The following is what I found. 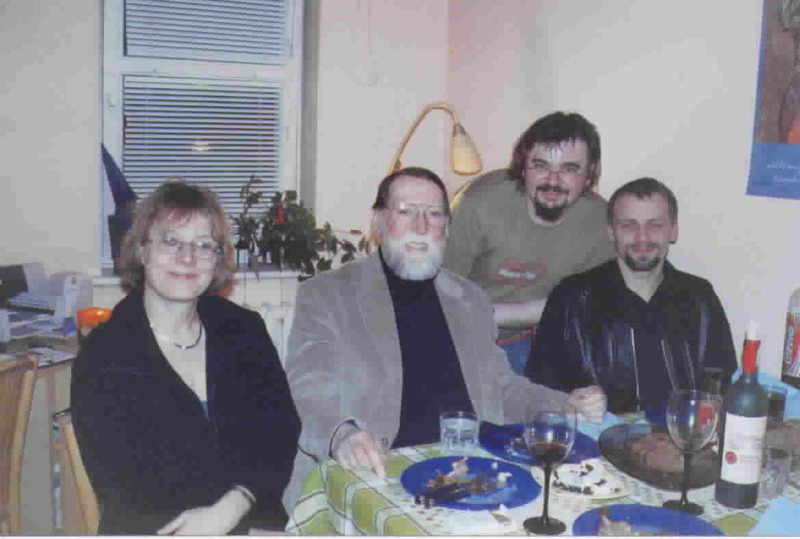 Joanna Ciechanowska was my host in Torun as was Artur Mikiewicz, Director of the College. Joanna introduced me to her course work and her students and Artur filled me in on the College and its programs. 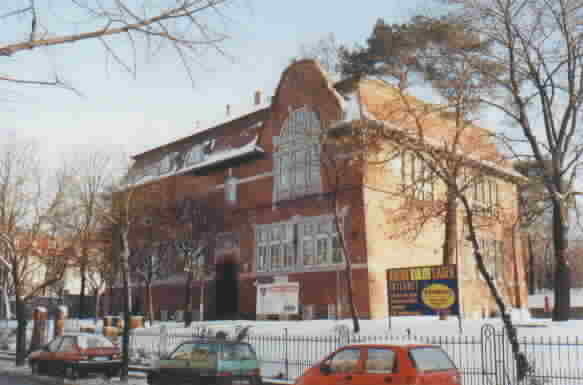 Torun Teacher Training College was established in 1990 to train foreign language teachers in primary and secondary schools and is affiliated with Nicholas Copernicus University. The program trains English, German, and French language teachers through course work that takes three years to complete. 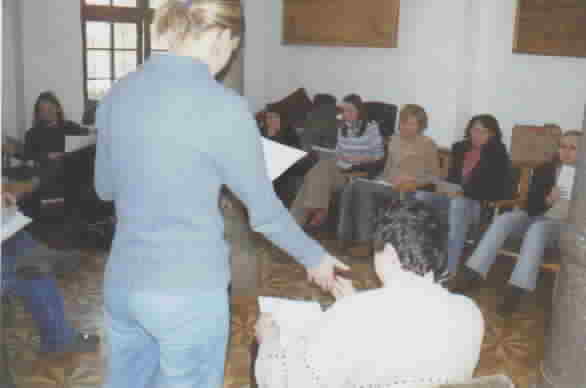 Groups of about fifteen stay together in the same group for the three years till graduation and follow a fairly fixed curriculum starting with practical language skills in the first year leading to more subject knowledge, pedagogy, and teacher training as the the student proceeds through the program. As mentioned above, the Drama Course is taken the first semester of the freshman year. The course starts with warm-up activities and proceeds through exercises that work with speech articulation, rhythm in verse, eliciting stories, narrating and acting out plays, story-reading, techniques of reading aloud, delivering dialogues, improvisation techniques, developing drama from improvisation, poetry reading, exploring Shakespeare, and ends with the writing and performance of the students' own play(s). The unit devoted to exploring Shakespeare is where I came in. Joanna was working with two classes, a day class and an evening class, on in-class productions of Macbeth. Both classes were working with the same material: an abridged version of Macbeth created by Anita Debska and linked with narrative "in such a way as to provide a portion of text to each student." 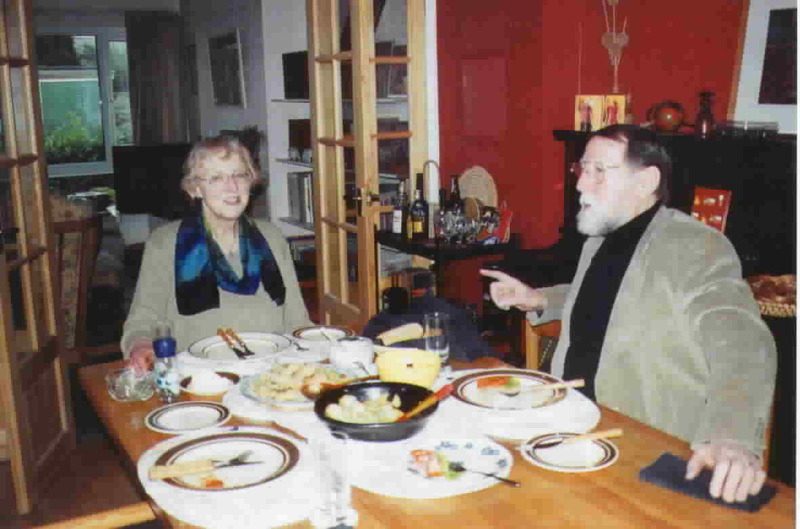 The previous activity had students memorize a poem for delivery in class. In today's classes, the students move around the classroom speaking their verses to different people for a warm-up activity. The story of Macbeth is then introduced by the teacher. After telling the basic story, she then goes to the board and writes some lines from the play on the board. She explains the way that blank verse works and how to express the rhythm. The teacher talks about stress and phrasing and has students practice in choral fashion. She then completes the telling of the story and has the students move into small groups where they work with various scenes tackling the language and the meaning of the language. To develop the understanding of the play and the characters, she has students articulate what the characters are thinking and what their objectives are. Rehearsal continues with the students interweaving speeches, creating still images of certain scenes, and doing improvisations based on character objectives. Finally, students continue reading the entire text standing in a circle reading different sections in turn. 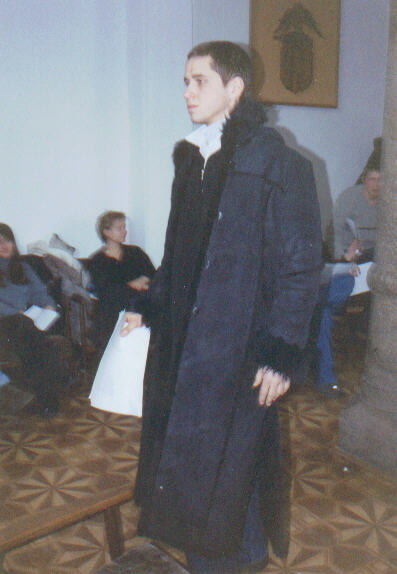 The second part of the unit is devoted to "Enactment". 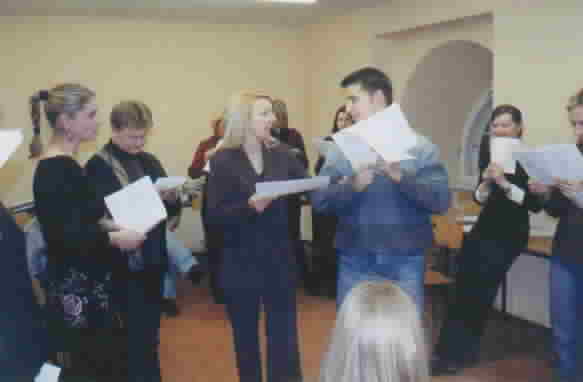 The four performance groups already established get together in separate circles with the scripts for their three scenes. They decide what characters they will play. 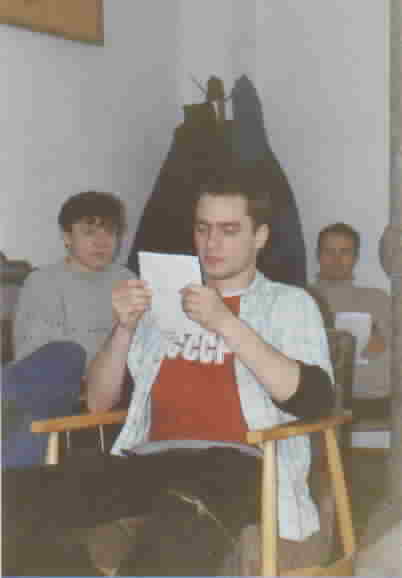 Then, they rehearse two group scenes, the banquet scene and the final scene when Malcolm becomes king. The two group scenes are rehearsed and next, the students are told to go to rehearse their scenes in preparation for performance. 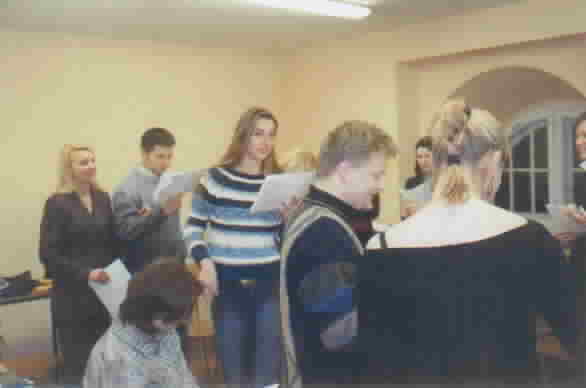 The groups go to different places in the large classroom and to other locations in the building to rehearse the lines and movement of their scenes. 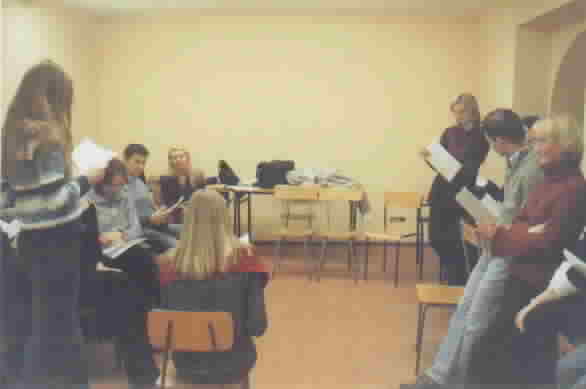 While the students are rehearsing, the teacher writes on the board a list of scenes by number and prepares the music to play between the scenes. She also coaches the students on proper pronunciation of some of the more difficult words and checks for clarity. Finally, the students gather together again and present their scenes as indicated by the order on the board. They are all engaged and alert to organize quickly and efficiently to present the play. They perform according to the movement patterns that they have worked out in rehearsal and achieve a remarkeable performance of Macbeth! The following pictures are photos of the two classes put together according to activities.